Talk to any addiction expert today and they will all tell you there is no one size fits all solution to the opiate crisis. Addiction is impartial and those affected by it cover the entire spectrum of humanity. Homeless, employed, educated, single, married, successful, popular, outcasts, it doesn’t matter. If there is any single thing in common with those experiencing addiction it would be the existence of trauma in their lives. So, if there is no single solution for this broad scope of suffering individuals why is the popular approach so narrow minded? It is my opinion that new policies and fear of overdose are actually in danger of making it harder for opiate addicts to become abstinent. While these policies are well founded and the fears legitimate, not every opiate addict wants replacement therapy (such as suboxone or methadone). Under this approach, any opiate addict seeking to stop their illicit substance use is now ushered into a system that utilizes suboxone and methadone as what they are referring to as “first-line treatment”. What this means is that should you call a detox facility or talk with a doctor about stopping (or reducing) your opiate use their response will be to get you into opiate agonist therapy also known as opiate replacement therapy. The two primary drugs used for this approach are methadone and suboxone. Because so many overdose deaths are happening in our communities (in 2016 almost 1000 British Columbians died of overdose and the 2017 numbers are even higher) doctors are hesitant, perhaps even agressively resistant when patients express a desire to detox cold turkey. This is well founded concern. Relapse is common among opiate addicts, when tolerance decreases (due to detox or reduction in use) the likelihood of overdose increases should one relapse. While the system is not capable (nor should it be) of forcing people into replacement therapy, it is skewed towards pushing people into it, and while some may disagree with this analysis the system also seems to want to keep them there. My experience is firsthand. As one who has lived experience with heroin as my drug of choice, I’ve detoxed cold turkey (countless times) and also spent a season of my life on suboxone (a period of 15 months). I understand exactly what it’s like for an opiate addict going through this system. My suboxone experience is long and involved and worthy of another article (coming soon), but for brevity’s sake I’ll simply say that I experienced enormous pressure from a clinic doctor to get on suboxone, and stay on it. In fact the clinic I attended had a policy that they would not start you on suboxone unless you were willing to commit to a minimum of six months. They were unwilling to consider a short term taper. At the time of course I was vulnerable, not capable of thinking clearly, and desperate for a solution to my heroin addiction. During the many months I took suboxone and visited my doctor for regular check-ups I was always committed to my desire to reduce my dose, and completely be off of the medication in about a year’s time. At every mention of reducing or stopping suboxone my doctor resisted me, questioning why I would ever want to stop taking it. I’m not disagreeing with replacement therapy, I understand its value and the ultimate goal of those in positions of authority to make policy that saves lives. There’s no aruging that this approach does save lives. However my concern is for the many like myself who would rather not go down the road of replacement therapy. The way the system is evolving is making it harder for those that would pursue abstinence to find doctors, and professionals who support their choice. An obvious example is the new on-demand addiction treatment clinic which opened in Vancouver’s downtown eastside in 2017. “The new DTES Connections clinic will offer door-to-dose in less than two hours,” says Dr. Ron Joe, Associate Medical Director, VCH-Vancouver Addiction Services. “That means anyone can walk in, no appointment required, and start their life-changing road to recovery right away.” or in other words anyone can walk in and get started on suboxone or methadone treatment on the spot. I just don’t think they’re capable of getting an individual into a detox or treatment center in two hours. If your desire is for abstinence the journey is much more difficult. While replacement therapy may be a reasonable start it can be a dangerous trap that is even harder to get out of than the very drugs one was using to begin with. The internet is full of the stories of individuals who wish they never started on suboxone or methadone. They wish they had more information at the get go, or had taken more time to understand the medications before starting on them. Some professionals suggest suboxone should only be used short term. “This idea is selling the patient short. Treating them with a “harm reduction” model rather than actually offering them comprehensive addiction treatment seems to be lazy, uninformed and shows little understanding of addiction treatment. Either that, or the doctor is simply looking for a paycheck since it is much more profitable to keep someone on long term maintenance than actually getting them clean and sober by giving them comprehensive treatment. I recognize this is not everyone’s experience. I also realize there are absolutely some who may need these medications long term, perhaps even indefinitely. This however is a bandaid solution that is actually making achieving abstinence harder for many. In my personal experience when I got serious about wanting to get off the suboxone I found that I was unable to successfully taper and do it on my own. Anxiety, sleep problems and other withdrawal symptoms were making it virtually impossible for me to function. My doctor suggested I just stay on it… unfortunately there were no public health facilities that were willing to help me, and I needed to go out of province for private detox (expensive) in order to find a facility willing to work with me through the suboxone detox a process which took 25 days before I started feeling better! I’m also concerned about the new legislation within British Columbia which has made it easier for any doctor to prescribe suboxone. They are making out ilke suboxone is the ultimate solution, and putting it in the hands of doctors who don’t have proper addiction education or training. Going forward what do we need to do? More resources need to go into actual comprehensive evidence based treatment methods. Individuals pursuing replacement therapy need doctors who get to know them and genuinely care for them, and a system that will support them moving forward in life and potentially into long term treatment (not 30 days programs). Medication can help here but it doesn’t address their emotional or trauma issues. The ‘just medicate’ approach is classic Western medicine. It deals with symptoms but not roots. For those individuals that don’t want opiate replacement therapy they need to know the system supports them too. Detoxes need to be WAY MORE available and willing to work with them. 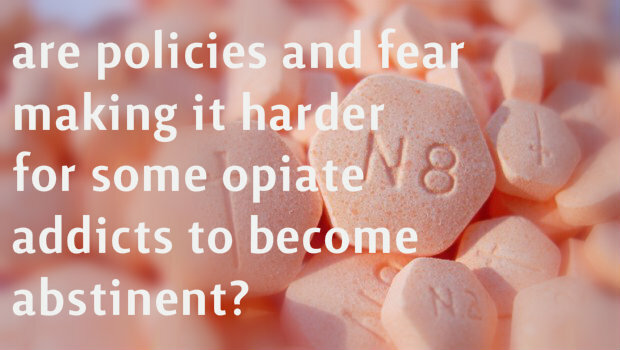 The system needs to be flexible and not operate from a place of fear of overdose. The only way this can happen is if more time can be invested into individuals, getting to know them and their story. Where would these resources come from? While that’s another debate all together it’s reasonable to suggest we move all the resources from drug law enforcement into treatment and patient care. I’m open to healthy dialogue on this and would love your participation in the comments below. What is your experience or thoughts? Loved your article. I totally agree about your criticism of doctors handing out scripts for Suboxone and methadone can be quite a free for all. It is so important to get to know the person and develop a relationship because it can be really hard to get off it. Recovery looks different for everyone and maybe it doesn’t always mean abstinence. That’s ok too, but I think recovery really means your quality of life and daily functioning comes back, and you’re no longer a slave to addiction. Many people are in recovery and choose to smoke cannabis occasionally, but do not pick up the needle ever again. Supporting people where they are at and providing as many avenues as possible for recovery is really what this work of love is all about. Thanks for your comment Cassie, appreciate what you have to say. I would love to say that we are in a system that is moving towards developing relationships with patients, but it’s not likely… the agenda of the BC gov is simply to save lives. There is no continuum of care, no way of helping people get into treatment, and for those that do there is poor transition and little to no after care. Not to mention your point that recovery doesn’t look the same for everyone.